Hosted By Tammie’s Reviews, Giveaways and More and Queen of Savings. 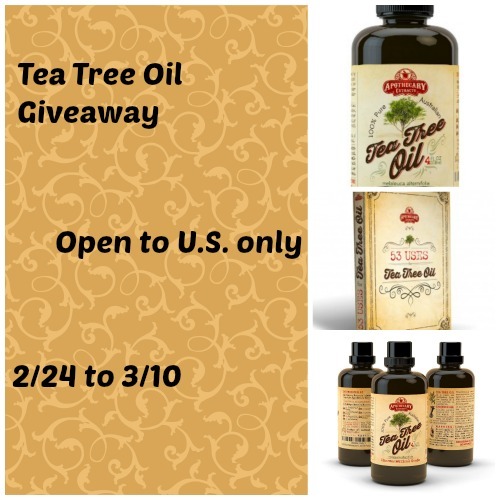 Apothecary Extracts sells this product on Amazon and when you purchase it they will send you an eBook – 53 uses for Tea Tree Oil . There are a so many reasons for using Tea Tree Oil that you would be surprises with. I have never tried an essential oil before! Something I would definitely be willing to give a try! Darlene – it’s a must-have in our house. You’ll be loving it, if you try it. I have! My faves are tea tree for my acne and lavender and lemon with coconut oil for a body moisturizer!